With the increasing epidemiological evidence for significant health impacts of particles (see Chapter 2.A.5), measurement of particle characteristics has taken on new urgency. With particles, both the chemical composition and size distribution of each component are important, and a wide range of sizes from ultrafine particles to coarse particles must be analyzed. While there is no fixed definition of "ultrafine" particles, those with diameters < 10 nm are often referred to as ultrafine (although in some cases, up to 100 nm has been included in this description). In addition, the chemical components encompass almost the entire periodic table and include inorganic and organic as well as elemental and complex molecular species. Hence the area of particle characterization is a very challenging one. Traditionally, particles have been collected and then analyzed for the distribution of mass and chemical composition. Various size ranges, or "bins," have been used, ranging from simple cutoffs at fO /jlm, for example, to multibin analyses in which particles in six or more size ranges are collected and analyzed individually. Such approaches have produced the vast majority of the data in the literature, and the techniques used are summarized briefly in the following sections. However, one might clearly expect significant variations in chemical composition between particles even within one range, and hence analysis of individual particles by size and composition is important. In addition, measuring such size-resolved properties in real time is desirable to elucidate sources, the atmospheric chemistry of particles, and the processes involved in their formation and fate. While techniques are now becoming available that address these concerns, this area of real-time and single-particle measurement could be considered to be in its infancy. Some of the instrumental techniques that have been successfully applied to ambient air are described in the following sections, along with some promising new approaches. The first steps in traditional analysis of the physical and chemical properties of atmospheric particulate matter are sampling, that is, obtaining a representative sample over the desired size range, and collection, that is, separating the particles from air. During sampling and collection, such parameters as humidity, temperature, and particle concentration must be controlled to maintain the sample integrity. Sampling of particles presents some different considerations compared to sampling of gases. The larger mass of particles results in a much greater inertia, so that when the gas flow curves sharply, the particles tend to go straight ahead. High or low inlet velocities as well as bends in tubing used to sample for particles can thus lead to significant particle size bias and should be avoided. In addition, the sampling lines should be as short as possible to minimize particle loss by gravitational settling and turbulent deposition. Losses can also occur on the sampling surfaces if an electrostatic charge is allowed to build up. Because it is particles in the smaller size range, <2.5 /¿m (PM25), that are of greatest interest with respect to health effects, inlet systems are normally used that exclude larger particles. These size exclusion inlets are usually based on filters, cyclone collectors, or impactors, the principle behind which is discussed shortly. Inlet cutoff diameters from 2.2 to f5 ¡xm are achieved in commercial instruments using these techniques (Chow, 1995). Collection of particles is based on filtration, gravitational and centrifugal sedimentation, inertial impaction and impingement, diffusion, interception, or electrostatic or thermal precipitation (e.g., see Spurny, 1986, Chapter 3). The choice of method depends on a number of parameters such as the composition and size of the particles, the purpose of the sample, and acceptable sampling rates. Table 11.10 summarizes some of the commonly used methods and the size ranges over which they are effective. Filters collect liquid and solid particles by mechanisms including diffusion, impaction, interception, electrostatic attraction, and sedimentation onto the filter while allowing the gas to pass through. The types commonly used in atmospheric particulate collection are membranes, fibrous mats, or porous sheets. Different filter materials are used depending on the particular type of measurement being carried out, including Teflon, quartz fiber, nylon, silver, cellulose filters, glass fibers, and polycarbonate. The characteristics of each are summarized by Chow (f 995). FIGURE 11.56 Schematic of Hi-Vol particulate sampler (adapted from Lawrence Berkeley Laboratory, 1979).
" The upper size ranges are usually related to inlet losses that prevent large particles from reaching the sampling surface. 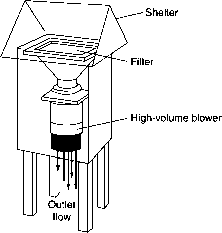 Different filters have unique characteristics, which include the collection efficiency as a function of particle size, the pressure drop at a given flow velocity, and types of reactions that occur on the filter surfaces. Perhaps somewhat surprisingly, sieving action is not the only filtration mechanism. The major filtering action is due to forces that bring the particles into contact with the filter surface where they may stick; these include impaction, interception, diffusion, sedimentation, and electrostatic attraction. At larger particle diameters and high flows, impaction is efficient, whereas at smaller diameters and flows, collection by diffusion to the surface is important; this increased efficiency at large and small diameters results in a minimum at ~0.3 /¿m in the curve of collection efficiency against particle diameter at the usual sampling rate per unit surface. Fibrous mat type filters include the frequently used paper (cellulose) fiber filter, for example, the Whatman paper filter, and glass fiber filters. A common fibrous mat filter used for sample collection and air cleaning is known as the HEPA filter (/zigh efficiency particulate air filter) and is made of a combination of cellulose and mineral fibers. A widely used type of fibrous mat filter is the high-volume filter, commonly referred to as Hi-Vol, shown in Fig. 11.56. A modification of the Hi-Vol filter to increase the total air flow allows the collection of sufficient particulate matter in relatively short time periods (e.g., 2 h) to carry out chemical analysis; this is important for studies of the diurnal variation of various chemical components of the aerosol as well as for minimizing sampling artifacts (Fitz et al., f 983). 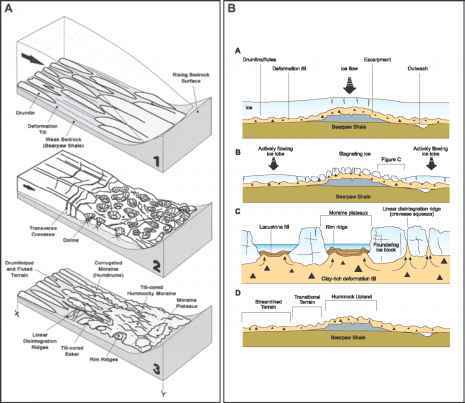 membrane filters, and silver membrane filters. Two types of membrane filters are Nucleopore and Milli-pore filters, named after their principal manufacturers. Nucleopore filters are thin films with smooth surfaces and straight, uniform cylindrical pores made by irradiating a thin polycarbonate plastic sheet in contact with a uranium sheet with slow neutrons. The neutrons cause fission of 235 U and the resulting fragments produce ionization tracks through the plastic; these tracks are then chemically etched to a desired and uniform size using a sodium hydroxide solution. Millipore filters have twisted, interconnecting pores that are much more complex than those in Nucleopore filters. They are available in different materials such as Teflon, polycarbonate, quartz, silver, and cellulose acetate. Membrane filters are particularly useful when surface analytical techniques, such as optical and electron microscopy and X-ray fluorescence analysis, are to be used subsequent to collection, because most of the particles remain on the surface of the filter. Filter sampling is also accompanied by potential reactions of pollutant gases with the particles on the filter or with the filter medium (including binders that are used in some filters) during sampling and the absorption of water from humid air. In the first case, conversion of gaseous S02 and HN03 to particulate sulfate and nitrate, respectively, has been observed on some filters. Some filters, especially paper filters, are hygroscopic and thus tend to adsorb water vapor from humid air. Glass fiber filters are relatively (but not entirely) insensitive to humidity, which is a major reason they have been used in the Hi-Vol reference method. However, even here the particulate matter collected on the filter may be hygroscopic and adsorb or desorb water. To minimize this problem, Hi-Vol filters are equilibrated at temperatures between 15 and 35°C and in air with a relative humidity < 50% for 24 h prior to weighing before and after sampling. Other problems with collection using filters, such as interference of impurities contained in the filter itself with chemical analysis of the collected particles, are discussed by Chow (1995). Impactors are based on the principle that particles in an airstream will tend to continue in a straight line due to their inertia when the flow of air bends sharply; if a surface to which they can adhere is present, they will impact on it and may stick. 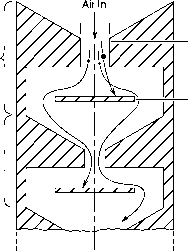 In practice, a collection plate is placed in the flow of air, causing the gas flow to stream around the obstacle; particles, however, may strike the plate and stick. Obviously, the larger the particle, the greater its inertia and the greater the impaction on the plate. The impaction efficiency (17) for particles depends directly on the particle diameter (D), the flow velocity of the air (V), and the particle density (p); it varies inversely with the gas viscosity (p) and with a parameter (Dh) that is representative of the impactor's physical dimensions (e.g., the inlet nozzle diameter) and that is related to the curvature of the airstream.